It’s no surprise that here at CJD Construction, our professionals receive dozens of roofing questions daily. Today, we’re sharing answers to some of the most frequently asked questions we receive. Q. How do I know I actually need a new roof? The most obvious sign of need for a new roof is visible roof damage. If your roof’s shingles are shifting, curled, darkened, or completely missing, your roof may be experiencing some serious damage. Leaks and drafts may also serve as cues to replace your roof, but it’s best to consult a professional before taking action yourself. There are, of course, less obvious signs of need for a new roof. One of the most common reasons for a roof replacement is age. If your roof is over 20 years old, it’s likely that it’s due for a replacement. Even if your roof is relatively new, there is no guarantee that it’s in peak condition without a professional inspection. A yearly roof inspection is key to maintenance and will ensure that your roof is in good working condition. 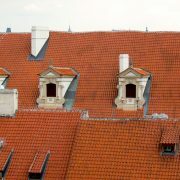 No two roofs are exactly the same. Even when houses are similar, the pricing of roof installation varies. That being said, you should never pick a roofer based solely on price. Firstly, your roofer’s experience, skill, and professionalism can obviously effect the cost of roof installation. It’s pivotal that you do research on your roofer’s work to ensure that you’re getting exactly what your home needs. At CJD Construction, we dedicate our time to working with clients to ensure the best quality at the best price. Secondly, the superiority of the materials your roofer uses is going to determine how much the installation of your new roof cost. Keep in mind that the materials your roofer uses may affect how long your roof lasts and how durable it is against weathering and damage. Our roofing experts are happy to work with you to determine what is best for your needs. Q. How long does roof installation typically take? Again, all roofs differ. Depending on where you are, what you’re looking for, and the nature of your home, there can be dozens of variables regarding the timing on your project’s completion. Specific factors such as the complexity of removing the old roof, the availability of necessary materials, and even weather can also change how long the process will take. Q. Is there anything I should do to prepare for the roof installation? Replacement of a roof is a noisy (and sometimes messy) process. In order to ensure the best experience for you and your family, consider planning to leave the house while contractors are working on the noisier aspects of the project. At CJD Construction, our roofing contractors take care in making sure that our work is not only precise, but doesn’t leave a mess in its wake. Keeping your pets in mind is also a precaution you may want to take. Typically, animals are not fond of the loud noises caused by the removal and replacement of shingles. Getting your pets out of the house or providing them a quiet space may ease the process. Q: My neighbor mentioned that some of the “flashing” on my roof looked as if it was in bad shape. What exactly is roof flashing? Flashing is an aluminum or steel material that goes over joined to prevent water seeping in and causing damage. Flashing can show damage because of weathering or oxidizing and it can occasionally come loose. If your roof is showing some flashing damage, it’s likely that there is little need to worry. Under most circumstances, flashing can be easily fixed by a roofing professional. Q: What is the best way to keep the valleys in my roof from leaking? The valley in your roof is essential to direct rainwater down the edge of your roof. In order to protect your valleys from leaking, a roofing professional can install underlayment. There is some debate about what the best underlayment is. Three of the most popular options are metal flashing, double coverage roll roofing material, and ice and water shields. Each option has its perks, but it depends on your circumstances. For example, some conditions wherein ice and water shields are installed require additional metal flashing. A roofing professional will be able to assess your needs and determine which underlayment process is the best fit for you. Any more questions? CJD Construction is here to make sure you have answers. If you need help getting started on your next roofing project, call us at (618) 659-9007 or send us an email at info@cjd.construction!